Farmers and an environmental group worry that a biotech corn suspected of containing toxic mold could contaminate the food supply, prompting them to ask Agriculture Secretary Ann Veneman to keep it off the market. They want the corn blocked until tests can determine whether it caused some hogs and cattle in Midwestern states to become infertile. Agriculture Department researchers suspected some Iowa cattle and hogs became sterile after eating the potentially moldy corn. An environmental group, Friends of the Earth, has sent letters to Veneman urging her to hold it from the market for more testing. Larry Bohlem, a spokesman for the group, said farmers in Minnesota, Michigan and Iowa who have had problems with the corn produced by Garst Seed Co. don't want to discuss it publicly. "They're kind of afraid because they're afraid to lose the value of their corn," he said Tuesday. Bohlem said the agencies that regulate grain, including the Agriculture Department and the Food and Drug Administration, have failed to act quickly. He said he is concerned the grain will end up in tacos and tortilla chips. That would be a replay of a scare that occurred two years ago when Aventis' StarLink corn, which wasn't approved for human consumption, was found in the food supply. Recovery efforts cost the food and farming industry billions of dollars. Maria Bynum, spokeswoman for the Agriculture Department, said the potentially moldy corn is the FDA's responsibility to investigate. FDA officials said they were looking into the matter. 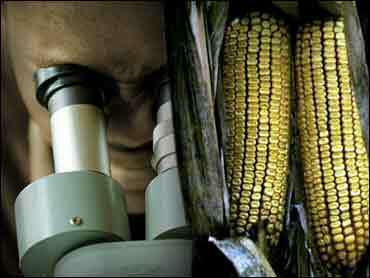 The corn is a variety known as Bt corn, genetically designed so it won't contain molds. Initial tests have indicated, however, that it contains the mold fusarium, which can sicken animals and humans. Researchers for the USDA's Agricultural Research Service have said, though, that a biological chemical compound may be to blame. Officials with the Slater, Iowa-based Garst Seed said they've conducted their own investigation but nothing seemed amiss. "We are confident that corn seed has not caused the problems he has experienced," company spokesman Jeff Lacina said in a statement. "The hybrids that Mr. Rosman purchased have been widely grown for several years and no one else who has grown them has reported similar experiences to us." Rosman said his sows appeared to be pregnant but produced no litters. He destroyed the herd, he said, but notified the Agriculture Department when he discovered four of his neighbors had similar problems. His cattle also were showing a decrease in reproductivity, he said. The corn "was the common denominator" in all the cases, Rosman said. Scientists began testing Rosman's corn last fall but had to stop this summer because of a court battle between Rosman and his father over dividing the farm's assets. To settle the dispute, a district court judge in Shelby County, Iowa, ordered the corn sold and the cattle, which also auctioned, Rosman said. "That's the wrinkle in this. Otherwise, this wouldn't be an issue, and this corn would be in my control and the livestock would be in my control and we'd just hang onto it for research," he said. Rosman hopes Veneman's office will hold the corn. Although the corn was sold, publicity about the grain led the elevators that bought it to reject it. Rosman's case has drawn attention from farmers in surrounding states. He said nearly a dozen Midwestern farmers and some veterinarians have come forward, saying they saw reproductivity drop in hog and cattle herds because of the grain.